Many of the oldest remaining buildings constructed in the City of Scottsdale reside within the downtown area known to locals as “Old Town”. With a population of just over 2,000 residents, the city itself was incorporated in 1951. While a number of the oldest structures remain, and are represented within the 5 square miles which constituted this city at its inception, much of the development is far newer. Many of the newer constructions appear much older than they actually are, as they were designed with an Old Western aesthetic to match the city’s slogan: “[The] West’s Most Western Town”. The development within the area known as the Civic Center Mall is a prime example of this. Titled in order to reflect its roots and attract tourism, the self-designated “West’s Most Western Town” does have some historical basis befitting this slogan. The earliest residents, arriving in 1888, were cattle ranchers. The community gradually grew and developed around a market constructed to aid with local agriculture and cattle drives. 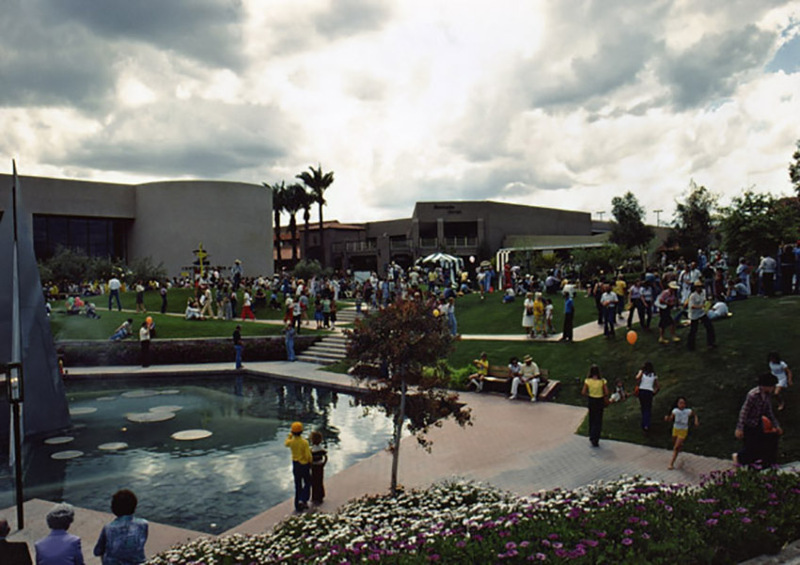 The area now known as the Civic Center Mall was fairly central to this development. 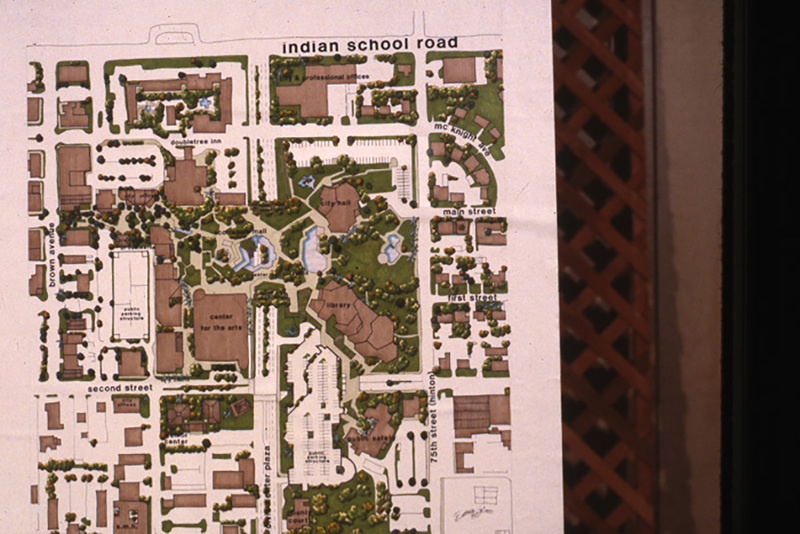 This area falls within Brown Avenue to the West, 75th Street to the East, Indian School to the North, and 2nd Street to the South. This was not only home to markets and businesses, but also hosted one of the city’s oldest neighborhoods. While some of this area remains untouched, much more has changed. 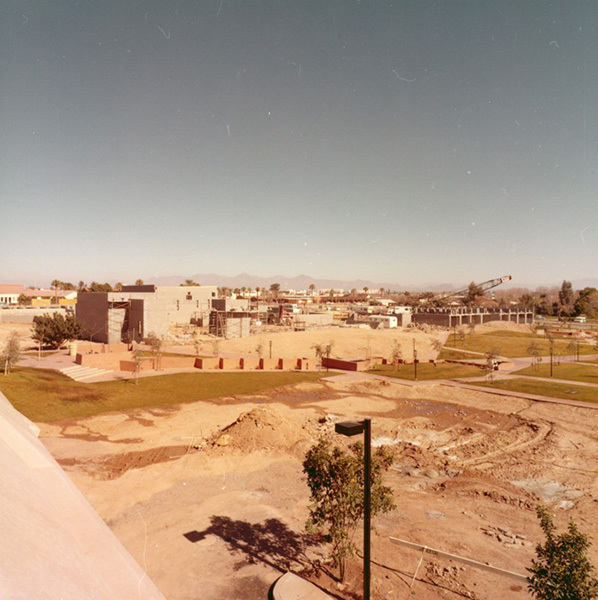 Major changes and construction began here in 1973. As part of a $5.2 million Neighborhood Redevelopment Program the city acquired 18 acres of this downtown area. The program was put in place to demolish and replace homes unsuited for living. Time had not been kind to some of the poorer residents within this area, particularly for the Spanish/Mexican residents who lived in some of the cities then oldest houses, but these residents were now about to be entirely displaced. The new developments of the 1970’s were mostly commercial. The City of Scottsdale originally budgeted only $400,000 for the construction, but a $7 million hotel, a $3 million performing arts center, 3 restaurants, and 55,000 square feet of retail shopping space known colloquially as a “mercado” replaced existing structures and homes. One of the architects spoke to the “critical need for [a] cultural meeting place” which was designed to represent the Old West but with a contemporary flair. Additionally, national Housing and Urban Development (HUD) funds were used to develop modern residences in the immediately adjacent communities, now a white majority, in one of the wealthiest cities in the state. 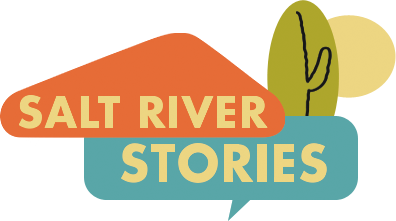 Aidan Solsten, “Scottsdale Civic Center Mall,” Salt River Stories, accessed April 18, 2019, https://saltriverstories.org/items/show/208. Abele, Debbie and Wilson, Liz, from City of Scottsdale. 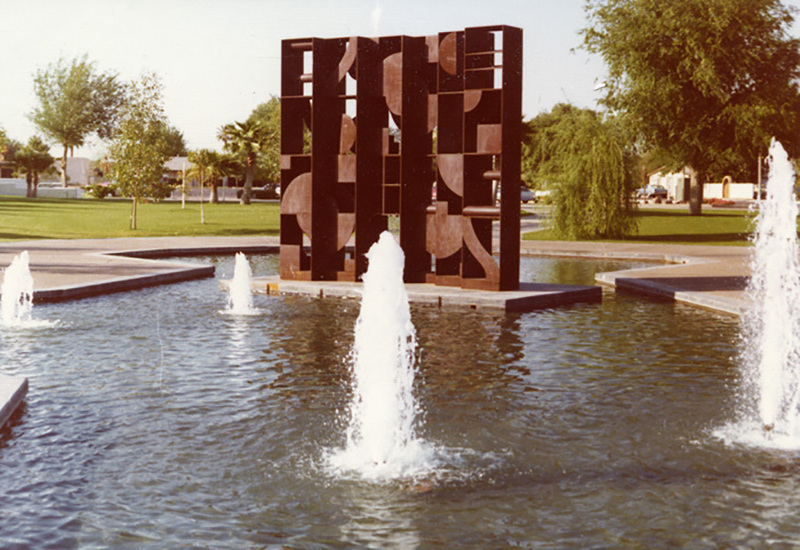 “Historic Context for Scottsdale’s Development as an Arts Colony & Tourist Destination”, available at http://www.scottsdaleaz.gov/Asset7422.aspx. Arizona Republic. “Scottsdale mall maintains Western image”, October, 7, 1973. Arizona Republic. “Scottsdale picks firm for Civic Center Mall”, May, 19, 1973. Arizona Republic. 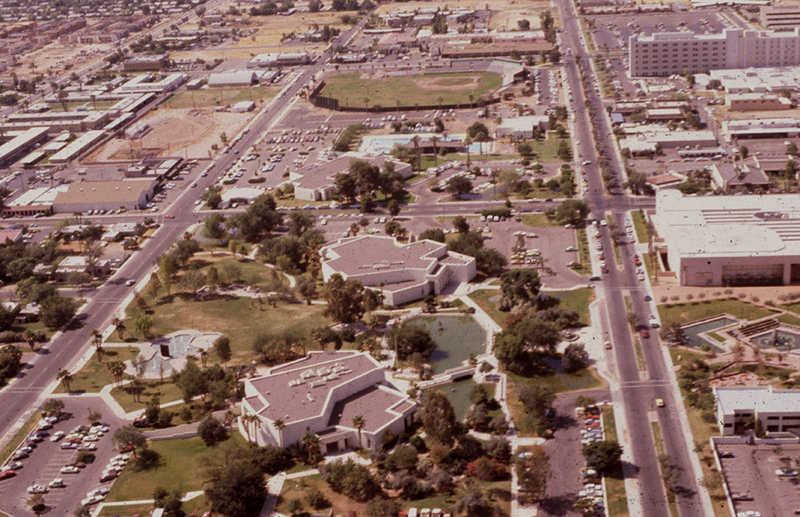 “Scottsdale plans center for all performing arts”, May, 10, 1973.